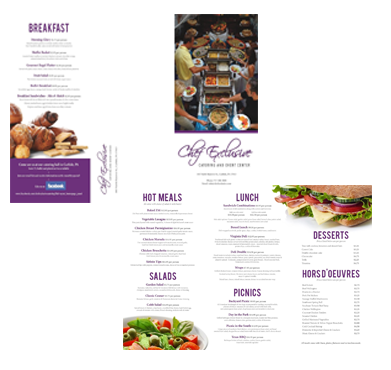 At Chef Exclusive, We offer a variety of menu packages to appeal to your event needs. Whether you are hosting a backyard get-together or planning an upscale wedding, we’re sure you’ll find what you’re looking for here at Chef Exclusive. Even with the rising costs of doing business, we have managed to keep our prices reasonable, without compromising the quality of food. All of our ingredients are delivered daily and brought fresh to your plate on the day of your event. Customize your menu to your liking! 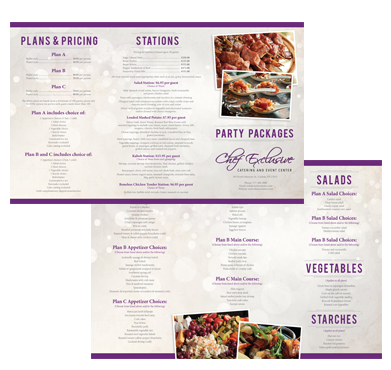 View and print our Party Packages Plans & Pricing brochure here. Mixed field of greens w/julienne vegetable and marinated tomatoes endive dressed with sherry vinaigrette. Yukon Gold, Sweet Potato, Roasted Red Bliss Potato with assorted toppings to include sour cream, sweet cream butter, chives, dill, oregano, cilantro, fresh basil, salt/pepper. Cheese toppings, shredded cheddar or jack, crumbled blue or feta, grated parmesan. Meat toppings, hearty chili, taco meat, crumbled bacon and chopped ham. Vegetable toppings, chopped scallions or red onions, steamed broccoli, green beans, or asparagus, grilled corn, chopped fresh tomatoes, grilled onions and roasted red peppers. *THE ABOVE PACKAGES ARE BASED UPON A MINIMUM OF 100 GUESTS, PLEASE ADD $5.00 PER PERSON FOR PARTIES WITH GUEST COUNTS LOWER THAN 100. Assortment of deli sandwiches along with cookies and brownies. Sliced meats to include turkey, roast beef, ham, chicken, turkey & pastrami, variety cheeses, roma tomatoes, avocado, romaine lettuce, pesto spread, guacamole, sun dried tomato mayo & jalapeno spread. Croissants, pumpernickel & seven-grain breads. Sliced seasonal fruit, homemade cookies & brownies.